As always, starting off our benchmark collection is our racing benchmark, DiRT: Showdown. DiRT: Showdown is based on the latest iteration of Codemasters’ EGO engine, which has continually evolved over the years to add more advanced rendering features. It was one of the first games to implement tessellation, and also one of the first games to implement a DirectCompute based forward-rendering compatible lighting system. At the same time as Codemasters is by far the most prevalent PC racing developers, it’s also a good proxy for some of the other racing games on the market like F1 and GRID. 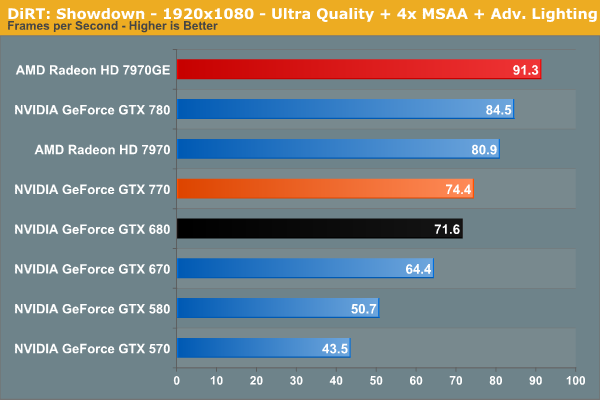 Despite the fact that it’s a $400 card, GTX 770 straddles the line between being a card best suited for 2560x1440, and a card best suited for 1920x1080. 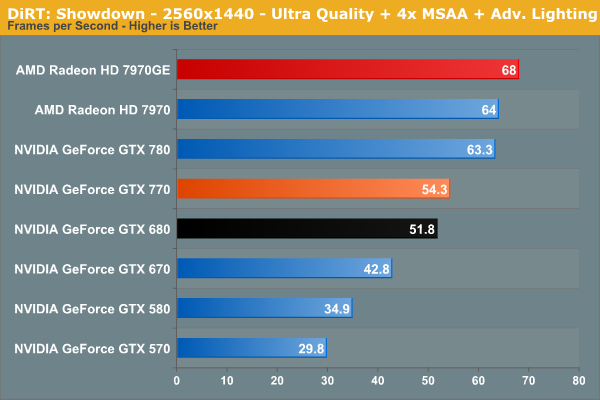 With GTX 780 and above we could get away with 2560 on the highest settings in most games, but with GTX 770 there will at times be compromises, either in quality/resolution, or dropping below 60fps. In any case, DiRT: Showdown remains a troublesome title for NVIDIA. With its advanced lighting system on, GTX 770 trails the 7970 – let alone the 7970GE – at every resolution. 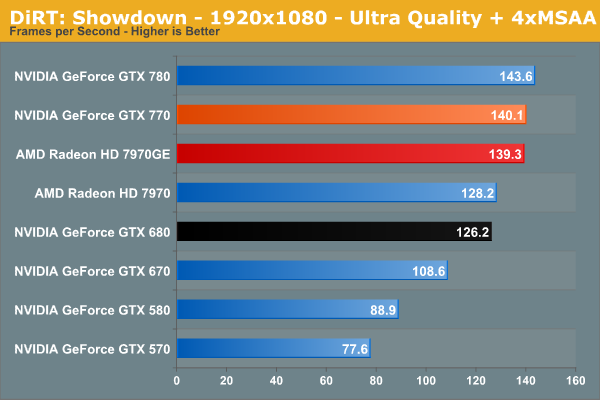 For GTX 780 this wasn’t a problem, but for GTX 770 this means dropping below 60fps at 2560.